Transparency-International UK (TI-UK) ranked Malaysia as having a “high corruption risk” in its defence spending and operations. Malaysia scored a D- on the Government Defence Anti-Corruption Index, putting us on par with countries such as Bangladesh, Pakistan, China, Russia, Kazakhstan and Jordan. Minister Datuk Seri Zahid Hamid’s main defence is accusing TI-UK of being “biased”. He says its method of research is unfair, the ranking method used on Malaysia is apparently different from that used on Singapore’s Defence Ministry and the index is based on “perception”. Alas, Zahid seems to be firing blanks. 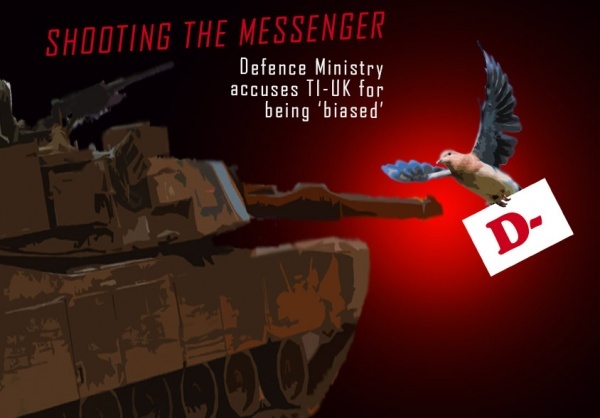 Transparency International Malaysia (TI-M) says the Defence Ministry raised no questions on methodology when the draft report was presented to it for its response. It added that the index is an independent expert assessment “involving expert reviewers, peer reviews and even representatives from the Defence Ministry”. REFSA had earlier raised a red flag on big-ticket military expenditure. Our country is not at war – why is there a need for the RM15 billion allocation in Budget 2013 for the Defence Ministry? Can our good minister be a little less defensive and a little more constructive? The issue of over-priced procurement and shoddy products is not new. The Auditor-General revealed that Defence Ministry blew RM3.2 billion on defective housing for military personnel, while no less than the Sultan of Johor has questioned the jacked-up prices that the ministry has paid for defence vehicles. We look forward to the day when federal government officials address the facts rather than attempt to deflect attention by questioning motives and raising perceived biases. Instead of plugging the leaks in Syabas, the BN federal government is filling up with more (taxpayers’) money. Prime Minister Dato’ Sri Najib announced that Putrajaya will give Syabas an additional RM120 million, on top of the RM606 million allocated earlier. This brings the total public funds channeled to Syabas within the last four years to RM 3.41 billion ! Selangor Menteri Besar Tan Sri Khalid says Syabas’ incompetence has caused Selangor to lose 663 million litres of water a day, an amount that is enough to meet demand for the next four years. Selangor’s resolve to take over Syabas is stronger than ever now, but is stymied by federal government shenanigans. Water, Energy and Telecommunications Minister Peter Chin states that the takeover is solely between the water concessionaire and Selangor, and that the federal government is not involved. However, Syabas revealed that the Finance Ministry, which has a “golden stake” in the company, does not approve. This is yet another example of ministers caught up in a tangle of contradictions. Our current Focus Paper series suggests how our corpulent Cabinet of 68 ministers and deputies can be streamlined. Check out REFSA’s infographic as well to see how our precious water is going down the drain. Our country’s path to a high-income economy is paved with over-taxed migrant workers. In yet another Cabinet about-turn, Putrajaya rescinded an earlier decision and now foreign workers have to pay their own levy. The government’s sudden decision followed a memorandum from traders and small business owners calling for foreign workers to be excluded from the minimum wage policy, as it is a “slap” to employers. MCA chief Datuk Seri Dr Chua Soi Lek also supported employers’ demand that levy be paid by foreign workers. In its haste to placate the irate bosses, Putrajaya has forgotten the reason behind making employers responsible for paying the levy. It was to “reduce reliance on migrant workers and ensuring local workers are given priority in employment”, said Tenaganita. 67 labour groups have called for an end to this discrimination in a joint statement. Finance Minister II Datuk Seri Ahmad Husni says that foreign workers’ salaries will increase under the minimum wage policy and they will be able to cover the difference. However, the National Union of Transport Equipment & Allied Industries Workers revealed that more than 600 employers had been given consent to delay the implementation of minimum wage. That adds insult to injury – the poor migrant worker is without minimum wage and has a levy to pay. Mixed feelings greet the announcement that Korean superstar Psy of Gangnam Style fame will be performing at Penang BN’s Chinese New Year open house on Feb 11. On the one hand, about 60,000 guests are expected to give him a hero’s welcome. On the other, many Malaysians pleaded with him on his Facebook page not to become “the political tool of Barisan Nasional”. Chief Minister Lim Guan Eng is very happy that superstar Psy’s first trip to Malaysia will be to the state of Penang. He urges Malaysians to give Psy a warm welcome, and suggests those attending the open house to dress in red, yellow or green to show support for political change, electoral reform and rejection towards the controversial Lynas plant. The bigger question is, has taxpayers’ money been used to finance the event? Penang BN officials claim that no public funds are used as a private organiser is footing the bill. REFSA wonders if any government-linked corporations (GLCs) are involved, though. As the Year of the Snake draws near, let us always be mindful of slippery characters that seek to deceive, misrepresent and manipulate. REFSA wishes all Malaysians a joyful celebration, and remember to makan in moderation! Gong Xi Fa Cai! Posted on 8 February 2013. You can follow any responses to this entry through the RSS 2.0.